Guardian/Partnerships with 74 Ranch - it's easier than you think! become a Hall of Fame kennel so we value and appreciate them greatly! In order for us to stay small in numbers, continue to improve our breeding program and our dogs to have more individual work done with them we place most of our breeding/show prospects in pet/guardian, co-own or partner homes. You own them, treat them like they are yours and we have some breeding rights (flexible). We will show them should we choose to do so and you agree or we can get you started in the show/performance rings or if those circumstances don't fit your lifestyle they can just be your awesome companion! We appreciate our partner homes greatly! It's a great program for all of us. We have references if you would like to hear from the other side of our program! We can only keep so many dogs at our own home (it would not be fair to the puppies to keep too many) yet we have some awesome puppies that we would like to keep in our breeding program in order to continue to improve it. A guardian home allows us to do that. We do a strict personality (using Avidog and Suzanne Clothier methods) and structure (Pat Hastings method) evaluation at 8 weeks. There may be more than 1 puppy in that litter that evaluates as show/breed quality yet we would not keep 2 puppies in our home at one time, for their sake. Or there may be NO pups in a litter we would keep in our breeding program, in which case the whole litter would be placed as pets. We would prefer to place the show/breed puppies in pet homes that are willing to keep them intact (not spayed/neutered) until 18-24 months old. This way, we can watch them mature and make a final decision at that time regarding their breeding suitability. We also try to have the puppy shown, although not required, so being close by helps us deliver or pick up the puppy to attend shows with us, or helps the co-owner be close enough to go to the shows themselves. A buyer attains the asset of the highest quality puppies we raise. You help us preserve our genetics and give our puppies the best homes. Partners get to pick the color and gender they want but we can't guarantee they will get a show/breed quality one in the first litter, it may take a few litters. Show/breed puppy buyers get priority. Guardian contracts are flexible, so be sure to talk to us about specifics. If you are wanting to get into showing/breeding, we will be happy to mentor you. If, prior to age 18-24 months, we decide not to include the dog in our breeding program, he/she may be spayed or neutered at guardians expense. Only about 50% of the pups placed on partnerships are actually bred. The dog becomes your pet, and will reside at your home the rest of its life. You assume its normal daily care, just like any other pet in your home. 1) Buyer keeps puppy intact (not spayed or neutered) until at least 18 months of age. 2) Dog is in our name, you are the "co-owner" on the contract, just to make paperwork easier. The dog's registration papers will be transferred solely into your name when we both make the decision to spay or neuter or the contract is fulfilled. 3) Puppy is show/breed evaluated for personality AND structure at 8 weeks old. Only the best of the best puppies from the most consistent litters are placed in guardian homes. 4) The breeder will work with the partner to attempt to show the puppy in the conformation or performance trials to earn a Championship or Title if either or both parties desire. Breeder mentors and works closely with partner home to the extent they want. 5) Guardian dogs will have evaluations done again at 2 years of age to determine suitability for breeding paid for by breeder. We typically only breed 1-3 litters from females. Males can be left intact for an agreed upon period of time and used per mutual agreement. Genetic tests include OFA (hips, elbows and patellas), CERF, CEA, DM, HC and PRA (eyes) and MDR1 (drug sensitivity). Dog will be evaluated for structure and personality again around 2 years old if breeder feels necessary at the breeder's expense. If the breeder decides dog is not suitable for breeding, he/she will be neutered/spayed at the guardian's expense, and breeder will relinquish any ownership rights. 6) Breeder will help arrange for and cover all fees for breeding, whelping and transport, if necessary. 7) Either the guardian or breeder can whelp litters. Breeder can return females 10 days post-whelping or keep puppies and mother through weaning depending on wishes of both sides. We love to have access to puppies for evaluation, but we're happy to mentor you through the experience if you prefer. Pups may (or may not) go to breeder at 6 weeks old for crate and leash training as well as evaluating and placing. 8) Genetic testing, evaluations, registration, breeding fees are the Breeder's responsibility and expense. We can discuss potential scenarios of puppy prices, placement and percentages on a litter-to-litter basis. Details are agreed upon in writing before puppy is picked up or delivered. 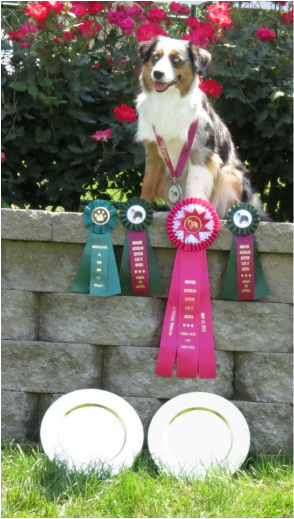 If you are interested in being a guardian for your next Mini Aussie, please contact 74 Ranch and we can visit more about it. Do we sell puppies to breeders? Rarely, we very rarely sell our puppies to breeders. Why? We place our dogs in homes with the HIGHEST chance for success and are meticulous about lining up puppies with families. The chances of a puppy turning out to be an exceptional breeding dog are in general pretty low as picky as we are. The pups bite might go off, they may not test clear for everything, their ears may rose or prick (rarely but they could), etc. We are wanting to slow down our breeding and enjoy our grandchild so we may place breeding dogs in the right homes. Be sure to inquire more. We do place our breeding prospects with guardian families, families that really do not care if their dog is bred or not. This way, we only breed the best of the best if the dog turns out exceptional, and the dogs all get to be the center of their families lives, forever. Breeding is just a small part of the dog's lives. We do provide stud service to outside breeders with approved females. Please ask for more information!